A show of comedy, reason, and alcohol. FUNNY YOU SHOULD THINK THAT! 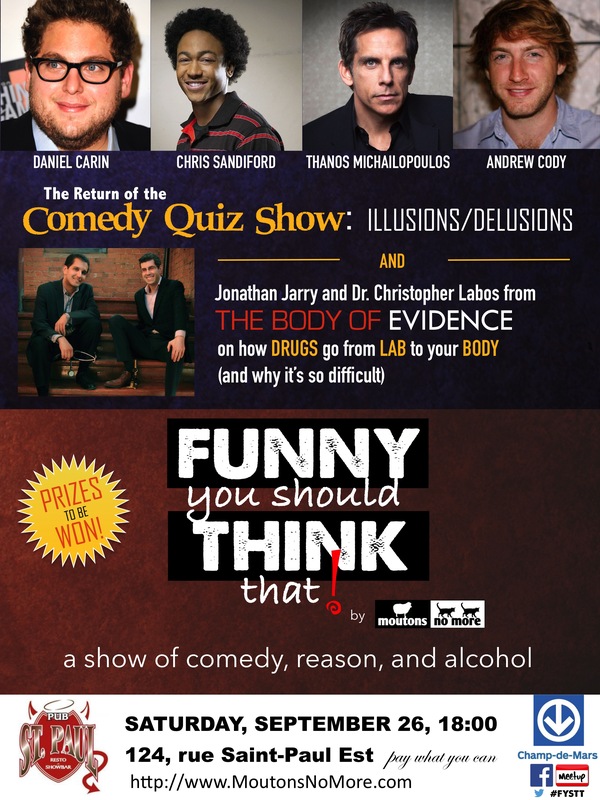 is a monthly event (intelligently) designed to make you laugh and think. Moutons No More takes to the stage with amazing guests to talk pseudoscience, lambast religion, and get you to think more critically. It’s like the Rolls Royce of Skeptics in the Pub and just what Montreal needs. Come for the show; stay for the conversation. To usher in a new season of shows, we bring back the ever popular comedy quiz show! A panel of stand-up comedians try to answer Jonathan’s questions on a skeptical topic, and the audience gets to play as well, with prizes to be won! Who brings the funny this month? It’s Thanos Michailopoulos (The Body of Evidence podcast); Daniel Carin and Chris Sanford (The Ladies and Gentlemen Comedy Show); and our permanent panelist, Andrew Cody. For the second half of the show, Jonathan and Dr. Christopher Labos take to the stage to talk about the pitfalls of biomedical research, from the lab to the clinic. Why is it so difficult to bring a drug to market? They’ll try not to insult each other too much. It’s all happening on Saturday, September 26 at Pub St-Paul in Old Montreal! 6:00 – 7:00: Come and order food and drinks, relax, and talk with us! 7:00 – 9:00: Moutons No More entertains you like no others with its show. 9:00 – midnight: Stick around as long as you want and talk! FYSTT is more than a show: it’s also a place to come and talk to other like-minded and on the cusp-of-being-like-minded individuals. Pay what you can. We always ask for contributions to help us keep this the best skeptical show in town. “Funny You Should Think That!” is best enjoyed surrounded by friends, so spread the word around and make it a group outing! English content, Funny You Should Think That!